Overreaction Monday is a very real and normal thing in the NFL. An impressive level of freak-out always accompanies the end of the first game of any NFL season, with massive leaps in logic and changes in expectations replacing rational thought. "The Patriots have issues!" "The Jaguars are for real!" "Jared Goff is a star in the making!" Those are all headlines and takeaways that otherwise sane people would glean from Week 1's results. But this phenomenon sheds light on what is one of the inherent difficulties of NFL handicapping and trying to make winning NFL picks against the spread : the small sample size. The NFL has by far the fewest games of any major sport. Baseball, by comparison, plays the equivalent of 10 years of NFL games in every season. The NBA and NHL seasons correspond to five years' worth of NFL games. Even college basketball teams play more than twice as many games as an NFL squad. This is not a knock against pro football. And this isn't a call for a longer season. All I'm saying is that in other sports it is a bit easier to find firm footing with your handicapping because your hypotheses have so much more time to develop. It's bad science to jump to conclusions without proper evidence. So just be careful about reading too much into one game and try not to overreact to the limited information we have gained on this season. 1. New England Patriots (0-1) - I'm not going to overreact to one game. The Patriots are still the best team in the NFL. 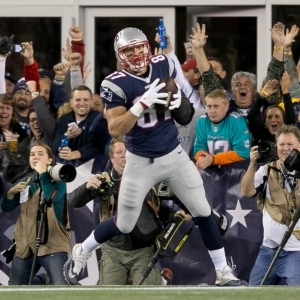 New England is an unreal 40-18 ATS following a loss. 2. Atlanta Falcons (1-0) - It really took max individual efforts from Matt Ryan, Julio Jones and Devonta Freeman to get the Falcons a bigger-than-it-seemed win on Sunday. Had they blown that game in the final seconds you'd have to wonder if a feeling of déjà vu would've set in for the defense. 3. Pittsburgh Steelers (1-0) - Antonio is an absolute god. And LeVeon Bell just learned why it's such a bad idea to skip the entire preseason. 4. Green Bay Packers (1-0) - Aaron Rodgers was up to his old tricks, trapping the Seahawks with 12 men on the field and taking advantage of that free play with a 32-yard touchdown pass. The guy is a savant. 5. Seattle Seahawks (0-1) - Coming off a loss and playing at home, you would expect the Seahawks to lay the wood this week. But there has actually been a bit of a reverse line movement with this 49ers game early in the week. Over 80 percent of the bets are down on Seattle, but this line has actually come down to 12.5 and even 12 at some books. 6. Kansas City Chiefs (1-0) - The Chiefs really need to regain their home-field advantage. Kansas City is just 3-9 ATS in its last 12 games at Arrowhead. They've had extra time to prepare and have a load of confidence heading into this week, though. Time to make it pay out. 7. Oakland Raiders (1-0) - I think it shows a lot of maturity that the Raiders were able to win a game, on the road, because of special teams. They dominated the third phase in Tennessee: not getting fooled by the onside kick, Cordarrelle Patterson made several big plays with punt coverage and in the return game to flip field position, and of course Giorgio Tavecchio, who had the game of his life. 8. Denver Broncos (1-0) - Trevor Siemian looked excellent on Monday Night Football. He was confident and decisive. And his calm approach is bolstered by the fact that Denver really has a trove of weapons for him to utilize on offense. 9. Carolina Panthers (1-0) - Keep your eyes on this Panthers team. Carolina's defense has looked completely devastating, and Luke Kuechly continues to be the best middle linebacker in the NFL. This group will be going up against former defensive coordinator Sean McDermott this week. 10. Arizona Cardinals (0-1) - I say it every time I talk about the Cardinals: I like their roster, I like their system, and this team should be a legit contender in the NFC. But Carson Palmer is a loser. Period. The guy actively loses games for his team. 11. Minnesota Vikings (1-0) - I have been an unabashed Sam Bradford fan for a long time. And I know I'm in the minority with that opinion. But if he gets that level of protection every week (or just most weeks) then this team is going to be incredibly difficult to beat. 12. Dallas Cowboys (1-0) - I'm not going to overreact to Dallas' defensive effort against the pathetic Giants offense. But the books might have; the Cowboys are road favorites in one of the toughest venues in the NFL to win this week. Dallas is just 3-3 ATS in their last six games as a road favorite. 13. Baltimore Ravens (1-0) - I love that the Ravens are going old school and returning to their ground-and-pound, physically dominating roots. The Ravens have won and covered three straight against the Browns but are just 2-5 ATS in their last seven home games against them. 14. New Orleans Saints (0-1) - I know it doesn't seem like it, but the Saints defense actually did look a lot better. They just ran into a hot quarterback. I am surprised that the Saints didn't try to bring more pressure, though, to rattle Sam Bradford. Regardless, I don't see how these guys don't give up at least 30 points to Tom Brady. 15. Tennessee Titans (0-1) - The Titans were one of Everybody's Sleeper Teams coming into the season. But if they don't win on the road this week they will be 0-2 and behind the eight-ball. The Titans are 0-5 ATS in their last five games at Jacksonville and just 1-6-1 ATS in their last eight meetings with the Jags overall. 16. Philadelphia Eagles (1-0) - It was somewhat of a misleading final for the Eagles. The final shows them winning by 13, but that was still a two-point game with two minutes to play before a field goal and defensive score inflated the final. 17. Detroit Lions (1-0) - Even I am guilty of not giving Matt Stafford enough credit. This guy is worth every penny, and that was an extremely impressive comeback Sunday in a game that they should not have won. 18. Tampa Bay Buccaneers (0-0) - I think that both Tampa Bay and Miami are going to be at a severe disadvantage this week. Their opponents were both able to knock off the rust and get the first-game kinks out. But Tampa and Miami are behind the curve after having the opener cancelled. 19. Houston Texans (0-1) - I don't know why this team ever thought Tom Savage was a better option than DeShaun Watson. You're going to have to live with some rookie mistakes. But Watson is a playmaker and gives Houston's offense a level of unpredictability and improvisation it hasn't had in years. 20. New York Giants (0-1) - I think that this ranking might still be too generous for the Giants, who I had ranked lower than most analysts heading into the season. Like I said in my season preview , Eli Manning is shot, and everything about this offense - from QB to OC to the line - is a disaster. 21. Los Angeles Chargers (0-1) - Joey Bosa didn't do squat on Monday. But Melvin Ingram more than picked up the slack with a devastating effort. The Chargers really made a mistake by abandoning the run when they got the ball back down three points with just over four minutes to play. 22. Washington Redskins (0-1) - The Redskins aren't as bad as they played on Sunday. They had one of the worst games of anyone in Week 1. But unlike teams like the 49ers, Colts, Jets and Bengals, Washington actually has talent on the roster. Enough talent that they should rebound. They are 9-2 ATS in their last 11 road games and the underdog is 10-4 ATS in the last 14 in this series. 23. Cincinnati Bengals (0-1) - I had the Bengals rated a lot lower than just about any other power rankings. Now you see why. Other than A.J. Green there is nothing to get excited about on offense. This team is rebuilding on the fly, and I think their young roster is going to take hits all season long. 24. Miami Dolphins (0-0) - Miami is at a severe situational disadvantage this week, having to travel to San Diego after dealing with Hurricane Irma all weekend long. 25. Chicago Bears (0-1) - Jordan Howard's drop on what would've been a game-winning touchdown will likely be a season-defining moment for the Bears. Chicago's defense looked excellent. The offense was able to move the ball a bit, especially on the ground. But the Bears gave away a winnable game against the defending NFC champions because of that horrid dropped pass. That loss may linger. 26. Buffalo Bills (1-0) - I will never, ever understand Buffalo's failure to commit to Tyrod Taylor long term. Even though he has next to zero weapons in the passing game (again), the guy just continues to make plays with his legs and with his arm. 27. Jacksonville Jaguars (1-0) - Perhaps the most impressive thing about Jacksonville's convincing win over Houston was the number of Texans that they injured. Seriously. The Jaguars were physical and aggressive, and Houston left the game with a lot of guys banged up and 21 players on the injury report Monday. That's what Doug Marrone and Tom Coughlin are all about. 28. Los Angeles Rams (1-0) - There were obviously a ton of positive things to come out of their 46-9 win over the Colts. However, 33 rushes for just 63 yards was not one of them. Let's see how this offense works when Goff is actually facing some pressure and when the team isn't benefitting from 14 defensive points. 29. San Francisco 49ers (0-1) - San Francisco is just 4-12 ATS in their last 16 games and 5-13 ATS in their last 18 road games. The 49ers are a putrid 1-9 ATS in their last 10 games against the Seahawks and 0-5 ATS in their last five games in Seattle, losing by an average of 21 points per game. 30. Cleveland Browns (0-1) - Cleveland's season began in the Brownsiest way ever: a three-and-out followed by a blocked punt into the end zone for a Pittsburgh touchdown. But they recovered, the kids and the defense played well, and Cleveland has now covered seven straight games (including the preseason) dating back to last year. 31. New York Jets (0-1) - The Jets straddled the number in that nine-point loss to the Jets, with bettors winning, losing or taking the 'push' based on when during the week they bet. But don't be fooled: that game was nowhere near as close as the final score. And Todd Bowles proved once again that he has no idea what he's doing with respect to game management, making several questionable decisions. 32. Indianapolis Colts (0-1) - Dear god. I just don't even know what to say about this total disaster of a team. There is no way that this team can win more than two games this season, even in the pathetic AFC South. I counted five guys in the starting 22 that could actually start for another team in the league. That's it. Five. Throughout the season I will have my NFL Power Rankings every Tuesday. My next ones will be released on Tuesday, Sept. 19. Robert Ferringo had a dominating Week 1 in the NFL, banking +$2,500 in profit, going 6-0, +$2,100 with his totals plays, and nailing a 7-Unit winner (Falcons-Bears 'Under') and a 5-Unit winner (Saints-Vikings 'Under') en route to an overall winning week. Robert is coming back with a potential 8-Unit NFL Game of the Year Play in Week 2 and he is working on back-to-back winning years on the gridiron. Robert has been the top football handicapper in the country the past five years, earning nearly $14,000 in total football profit. He has also posted five of seven winning seasons (including a winning 2016-17) and tallied over $20,000 in football profit between 2011 and 2016, including his amazing 2013 NFL season in which he hit 62.1 percent (95-58). Robert has produced 18 of 29 winning football months and an amazing 41 of 64 winning football months over the past decade. Also, Robert's proprietary KING College Football Betting System has posted three of five winning seasons Robert is looking to follow up a winning 2016 with more profit this fall. SIGN UP HERE TODAY AND TAKE ADVANTAGE OF OUR EARLY BIRD SPECIALS !